This thing is starting to be a habit! Last year we did it with the boys, but that trip we got totally shnockered, and I never did get good notes, but man did we move though a lot of wine! This trip, was a bit more shabbos like, we sang, actually spoke about things relating to the weekend, and yes we drank a fair amount of wine. However, the wines for this trip were purposely dedicated to the west coast, no wines at all from Israel or France of the like. Of course the vast majority of them were Four Gates wines, but we also had a Shirah wine in there, the new Aglianico, and a very nice Covenant Sauvignon Blanc from 2011 that was screaming!! I will skip the pleasantries and the such, as we all know who Four Gates Winery is and that he is a friend of mine, which is why we have our “yearly” Guys outing there! This year the shabbos was not just friends of mine from out of town but also some friends from here in San Jose! Of course none of this would have or could have happened without Binyamin Cantz, winemaker, owner, cask washer, cellar rat, vineyard manager, and all around dude of Four gates Winery – you get the point! I was happy that I may have only gotten him angry at me once over the shabbos, maybe twice, which for me is a record! Anyway, the notes and the pics of the wines follow – have a great week all! lovely and screaming! The nose is lovely and citrusy, with sweet oak and oriental spice. The mouth is more polished and elegant with great acid, guava, pineapple and great acid with great sweet fruit and fig. The finish is long work lovely fruit, hints of butterscotch and rich summer fruit. I have written often about Four Gates Winery, here in 2008, again for a Shabbaton, and then when I crashed Alice Feiring’s visit to the Four Gates Winery, and then my last writeup – the most complete to date. As always, I state up front that the winemaker, Benyamin Cantz (Benyo) is a good friend of mine and that in the end, the wine talks and scores and notes I give on wines are unbiased, as much as I can be. Benyamin is a Vigneron – as explained before, Vigneron is French for wine maker and winery owner, but it also means that it is a person who does it all – wine wise. He manages his vineyard, he manages his cellar, and makes the wine – a nice way to say one-man shop. Is that good? Well, I can say it is awesome because he gets to know his vines and wines, but really it is just a view into the unique man who is himself the physical embodiment of the Four Gates Winery. The vines are grown organically and meet the CCOF standards of organic farming. Please do not think that a Vigneron is not a farmer. Remember he grows his grapes and knows his grapes and does so in an ecologically sustainable manner – since he started in 1997. This is NOT a fad for Binyamin – it is part of his way of life. His vines are dry farmed (there is that word again) – and for good reason. The Pinot pops because of it, as does the Chardonnay and Merlot. Essentially, dry farming allows for the fruit flavors to concentrate as the vine stresses. Stress, for a vine, is great. Too much stress, like in humans is BAD! Luckily it does not get that hot in the mountains and therefore, the water requirements are lower, keeping the stress constant – but maintainable. 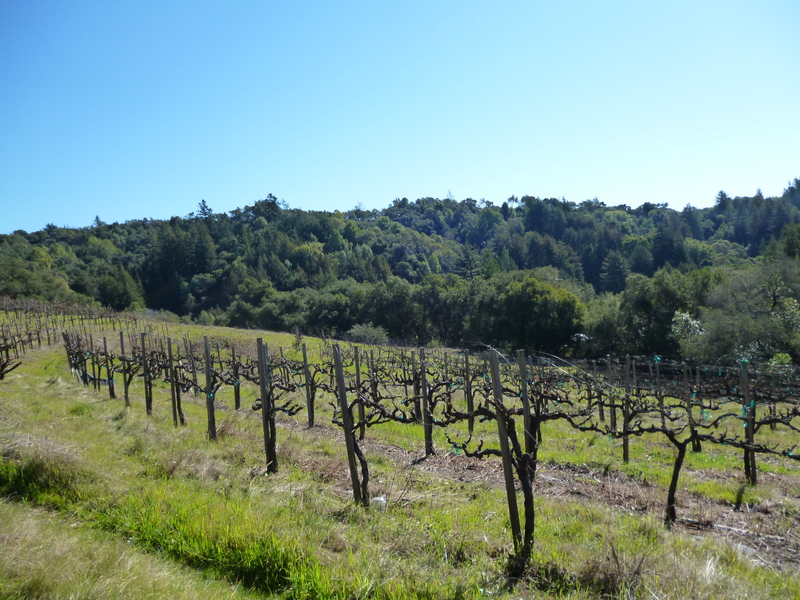 The climate in the vineyard and winery, as mentioned earlier, is indeed cooler than the city it overlooks and that helps the vines in many ways. The obvious benefit is that the vines need less water than they would elsewhere. It also allows the vines to cool down over night and it allows the vines to stay cool for longer, meaning more ripening time, but in a controlled manner. The cooler climate makes for perfect Pinot, Chardonnay, and Merlot and believe it or not Cabernet Sauvignon, which is why the 2009 Cabernet Sauvignon from Monte Bello Ridge in the Santa Cruz Mountains is so FANTASTIC! Yes, I am sure you would think that Cabernet in a cooler region would be a disaster, as it would never fully ripen. Well, a not-so well-known fact is that the 2005 Four Gates Merlot M.S.C. has a bit of Benyamin’s Cabernet Sauvignon in it. WHAT? Yes, Benyamin grows a very small amount of Cabernet Sauvignon (I hope he does not kill me – LOL!) His Cabernet Franc also benefits from the cooler weather. 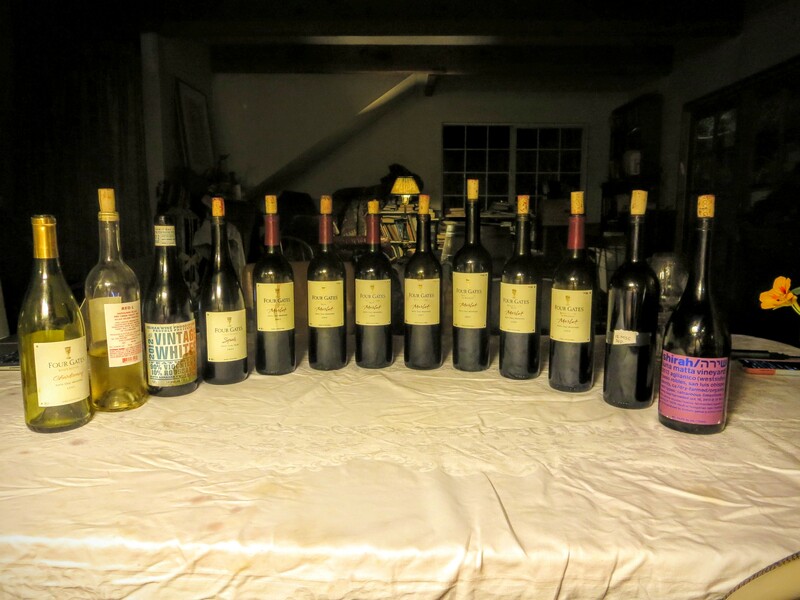 On October 22, our friends invited us along with Benyamin Cantz, proprietor of Four Gates Wine, and a few other friends for a Friday Night meal that would be accompanied by a vertical tasting of all currently released Four Gates Syrah(s). A vertical tasting is what it sounds like; vintages of a similar wine from a single winery. A horizontal tasting is common wines and varietals from multiple wineries and vintages. 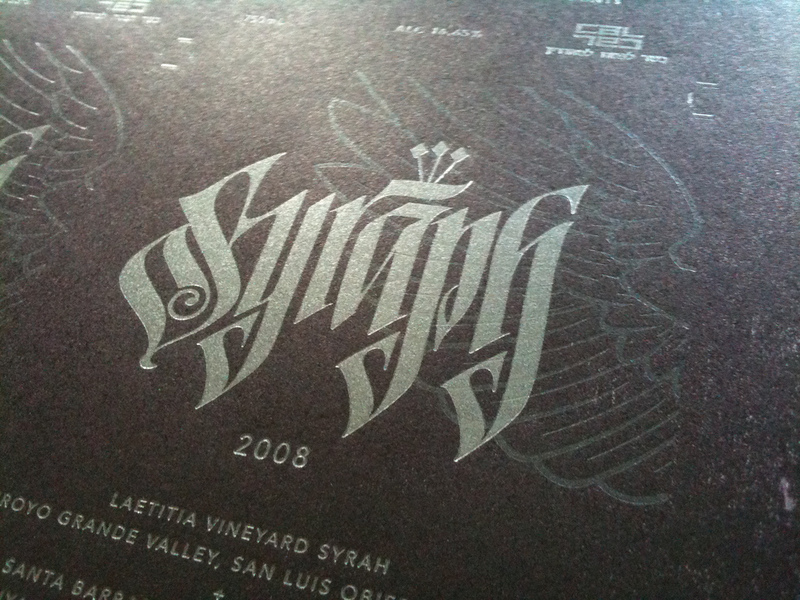 We had the wonderful opportunity to taste the 2003, 2004, and 2005 Four Gates Syrah in the same sitting. The meal started off with a tasting of the 2004 Four gates Chardonnay. I have had two different tasting notes about this wine, one with toasted oak and butterscotch, and one being oaky and fruity. This time the wine showed off its toasty oak, butterscotch, ripe fruit, and lemon/citrus fruit, another hit. I want to thank our friends for hosting the wine vertical. The meal was awesome and one that paired extremely well with the wines being served. The nose on this electric gold colored wine is filled with heavy and luscious toasted oak, a whiff of burnt oak, lemon, melon, peach, toasted almond, spice, Crème brûlée, and butterscotch. The mouth on this full bodied wine is spicy with Crème brûlée, layers of concentrated toasty oak, along with butterscotch, melon, and a hint of almonds. The mid palate is packed with more oak, lemon, and bright acidity. The finish is long and spicy, with tasty oak, butterscotch, and lemon. The oak calms down a bit with time, but the flavors are still there with tight concentration and brightness. The nose on this purple to black colored wine filled with tar, chocolate, black pepper, licorice, alcohol, oak, black plum, blackberry, and thyme. The mouth of this full bodied and layered wine is filled with mouth coating tannins, black plum, blackberry, and tar. The mid palate plays off the mouth coating palate with more tannin, acidity, oak, and chocolate. The finish is long and smoky, with tar, black pepper, plum, and acidity. Quite a nice wine that has a few more years left in it. The nose on this deep to brooding purple to black colored wine is screaming with inky black ripe fruit, cassis, blackberry, raspberry, plum, chocolate, tar, black pepper, and oak. The mouth on this full bodied and velvety wine is inky and dense, along with waves of cassis, blackberry, and plum. The mid palate of this wonderfully complex wine has integrating tannin, oak, acid, and tar. The finish is long with tar, oak, chocolate, cassis, plum, and black pepper. WOW! This is a killer wine. The first thing that hits you when you open this bottle of wine and peer into its purple-black stare is the ripe blueberry notes that come screaming out at you, along with blackberry, cassis, plum, tobacco, chocolate, tar, and rick oak. The mouth on this full bodied, mouth filling, concentrated, and structured wine comes at you in layers with fruit that follows the nose, ripe blackberry, plum, blueberry, tar, and oak. The mid palate is balanced with acid, oak, tobacco, and chocolate. The finish is super long, black, and spicy, with rich oak, chocolate, tobacco, tar, leather, and blackberry. This is a truly wonderful wine that is highly structured with lovely tannins and a wine that still has a few years left under its belt. The nose is killer with the lovely ripe blueberry and blackberry, along with the oak, tar, chocolate. It follows through with the mouth till its tantalizing finish. Quite a powerful that has its sea legs beneath it and bright horizon ahead. This past week saw me hanging out with Benyo at his house for his yearly Carlebach Shabbaton. For some 15 or more years Benyamin Cantz has very kindly offered his home and space to some 40 or so souls who wish to spend time with each other and Rabbi Naftali Citron (who is currently the Rabbi of the Carlebach Shul in NY). Starting in the mid nineties, Benyamin kindly agreed to host a group of Rabbi Citron’s follower’s for a shabbaton – Carlebach Style. This year many of the old timers were there, along with many new faces, like my own. This was a spiritual experience for me personally. Many of you who know me, know I am a religious person, but still this rustic setting, surrounded by 40 Jews who just want to get closer to God, friends, and the Rabbi, made it that much more special. It all started on Friday day when I arrived at the winery to help prepare for the upcoming shabbos. Normally a shabbos meal is a breeze for me and /or my wife. However, 40 guests descending upon the hilltop in the middle of nowhere is not quite a normal shabbos. Along with the fact that the housing surrounding the winery and Benyamin’s house made Yosemite’s outback look like small. For as far as your eye could see around the winery there were tents upon tents. As we were preparing folks started showing up looking for a good place to drop their wares and tent. The old timers knew the best nooks, while the newbies, well they were left to fare with the second run spots. Still a hilltop surrounded by a winery, vineyard, friends, and an awesome Jewish experience is hard to call a second run spot. People would kill to be able to just park themselves down and relax among the picture perfect nature that surrounds you. 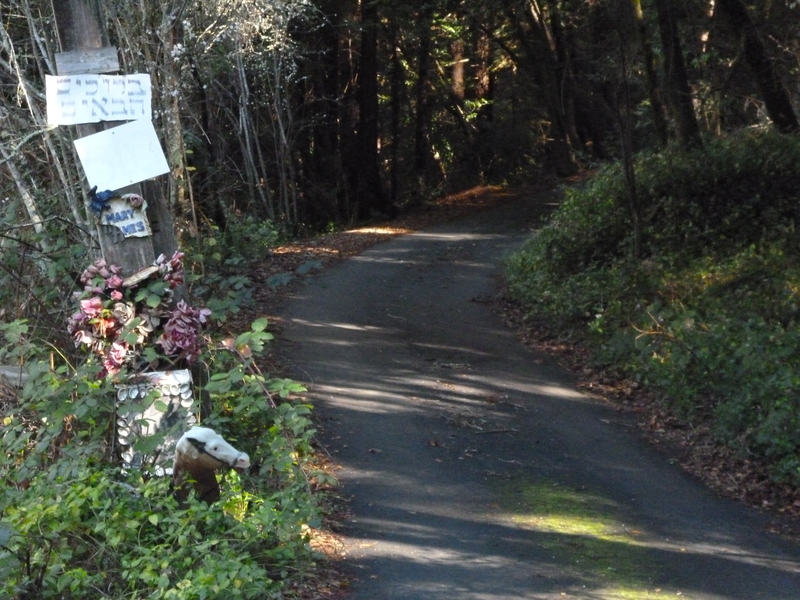 The soaring Redwoods provide shade, the sounds of nature abound around you, the farm life walks about you, including horses (that show up like clockwork during the prayer service), goats, and chickens, along with the wild life as well. The feeling permeates you, no matter what you are doing. Whether I was chopping vegetables, slaving over my vegetarian lasagna, cleaning up whatever was not physically moving, implementing traffic control within the house, managing to catch a glimpse of the whitesox losing to the Orioles, it did not matter. No matter what – it was a ball and there was this palpable level of suspense and awe around the shabbos that was fast approaching. It held so much promise, mystery, and lore, that it was sure to be a grand time. Of course Benyamin did not just wake up on Friday and start getting ready for the event. As usual, Benyamin is the cog that runs the event, but it was nice to see many step up and pitch in. As night fall quickly approached the window that overlooked the land around the winery was filled with the hustle and bustle of classic Jewish life on a Friday evening. Except here it held itself to an almost different rhythm and cadence, one filled with unbridled enthusiasm of what the wonderful shabbos held in store for them all. Ladies helped check and clean the vegetables of bugs, my most hated task in the entire world. Others made the fish or the myriads of salads that later graced the tables that evening and the following lunch and sholesh seudot. Finally, shabbos arrived and everyone’s pulse calmed to a stillness that is reticent of a person lying on a beach in the evening watching a meteor shower. True calm and relaxation coupled with awe and excitement, waiting for the next starburst or streak of light in the sky. Things started a bit later as people arranged their lives outside. Soon we prayed the afternoon prayers and started the Kaballat Shabbat. It was at this time that I had my first real glimpse of Rabbi Citron. Until this moment I was either working, getting dressed, or leading the prayers. However, as the shabbos came into fold Rabbi Citron lit up the sky with his relaxed pace and delivery, glistening eyes, and calm and soothing voice laying out how the evening prayers would progress, culminating with a single file walk in the pitch black darkness to the overlook of the vineyard and Santa Cruz below from the peak of the hilltop, to shepherd in the Shabbos Queen, during the completion of Sholom Alechem. The davening was led by Rabbi Citron using many Carlebach famous melodies, while also masterly weaving in some current ones as well. Once evening prayers were completed, the room transformed into what can only be explained as a version of musical chairs, except utilizing chairs, tables, partitions, and humans, all moving in a wonderful fluid dance, choreographed and masterfully managed by Benyamin and a few very nice old timers. The meal was quickly laid out on the tables, a bounty of food, wine, and beverages. The meal started with Kiddush over a yet to be released Four Gates red wine blend. It was followed by blessing over challah. Soon, we were served an almond/carrot bisque, seasoned with a unique set of spices and flavors, including fennel/anise. This was paired with a never released 2002 Chardonnay, which is screaming with characteristics easily associated with the Meyrieux barrels the wine was aged in. The main course consisted of caper roasted salmon (awesome recipe), with the capers infusing the very flesh of the salmon, fantastic. This was accompanied by a myriad of salads and side dishes that I have honestly forgotten, there were so many! The main course was paired with a wine that I had not tasted up to that point called the 1-2 punch, a 50/50 GS mix of Grenache and Syrah. The wine was so fun, original in styling, flavor, and structure. I do not remember ever tasting a 50/50 kosher GS, so that was cool. The wine was made by Shimon & Gavriel Weiss, who started a garage winery in 2008, and have since moved a couple of times but have expanded their wines and bottle count. I hope to do a more complete write-up on them both very soon – God Willing. The next day the day started late with a 10 AM start to prayers (give or take a bunch of minutes). The Rabbi started with a short but extremely powerful discussion of theology and the Torah portion from Rav Nachman of Breslov. The words were deep and hit home hard and often, truly wonderful. The prayers carried on for 3 plus hours, and throughout the entire service, there was a cacophony of chopping noise coming out of the kitchen, as the ladies chopped their way to the finish line, with the only proof left over being a compost bin full of vegetable carcasses and massive bowls of fresh green salad and a bunch of assorted salads, just crazy. Mega kudos go to the ladies who did all the checking and cleaning of the vegetables. However, once again it cannot be underestimated the huge round of applause that Benyamin deserves. If you can imagine a bunch of strangers showing up at our doorstep, chasing you out of your home, and setting up shop in your kitchen chopping, cutting, cooking, and cleaning, while you stood by helpless. Now I am not, God Forbid, calling the people who helped this past shabbos thugs, heaven forbid, but to Benyamin having that many people in his kitchen without being able to manage and overlook the work being done, it causes him to be uneasy and some anxiousness, both of which are not fun. Anyone in his shoes would feel the same, essentially giving over the keys to his kitchen, home, land, and sanity for an entire weekend, would drive any many batty. Yet Benyo was the consummate gentleman and host throughout the weekend, so many thanks to you my friend! Once again the room did a quick change from prayer hall to lunch room! Once again the partitions removed, tables added, chair placements reset, and tables set with eating utensils and loaded high with food. My lasagna was served along with a lovely trout and mounds of salads and dips. The food was paired with more 2002 Chardonnay, the 2004 Yatir mix, a bottle of 2006 Four Gates Merlot, a bottle of the 2005 Red Fern Merlot, and a crazy bottle of Syraph made by the Weiss brothers. This may well have been the highlight of the day for me when everyone around the tables went around and all said a quick word on the Torah portion, or told us history of the event, or just introduced themselves. Either way it was clearly a situation where all the participants opened themselves to the group, making them openly vulnerable by allowing us to see them all in a different light. Once again Rabbi Citron orchestrated the turns, allowing us all to partake and make it a memorable part of the shabbaton. There was even a clandestine meat cholent after lunch served outside on paper plates of course. The cholent was constructed by Gavriel before shabbos, and I helped a bit cutting the vegetables up. However, he brought the meat and stuffing – it was a killer cholent! The Weiss brothers kindly poured a bottle of 1-2 punch and it was awesome again. After the meals and the cholent it was time for a pair of classes from Rabbi Citron and they were wonderful. The first parlayed off my daily Daf Yomi studies, while the second was more teachings from Rav Nachman of Breslov. That was followed by Mincha services and are you kidding me – more food!!!! Yep, sholesh seudot! I could barely eat. I ate my requisite slice or two of bread, so no wine consumed. Finally, the evening came to an end with a lovely havdalah service, once again led by Rabbi Citron. My personal take aways from it all was the warmth, the openness, the nature and the slow pace, the lovely voice and davening of Ra bi Citron, his classes, and all the awesome food. It was a wonderful event and one that I hope will continue so that I can lend a hand again and partake of it powerful messages. The nose on this blue to purple colored wine is screaming with either chocolate malt or espresso coffee (different nose between two bottles), sweet oak, crushed herbs, and lovely red fruit. A medium bodied wine that plays into a bigger wine in your mouth from its mouthfeel of integrating tannins, oak, and chocolate malt/espresso coffee. The fruit peeks out in the mid palate along with acidity that is slightly unbalanced. The finish is long with herbs, more malt/coffee, and oak. The tannins are nicely integrating creating a more plush mouthfeel. This wine is in a world of hurt and needs to be drunk now. Not memorable in any way. After the Cabernet debacle I was not expecting anything from this wine. However, it was barely alive showing nice mouthfeel, along with oak, black plum, and raspberry. Not bad, drink up. The nose on this purple to black colored wine is screaming with tobacco, oak, spice, blackberry, and plum. The mouth on this full-bodied wine is packed with blackberry and nicely integrating tannins. The mid palate is balanced with oak and acidity. The finish is super long with tobacco, spicy oak, blackberry, and plum. The nose on this screaming eagle of a wine is packed with tar, oak, blackberry, plum, pepper, malt chocolate, and spice. The mouth follows the nose with crazy concentration of tar, blackberry, and oak. The mid palate is balanced with oak, nice tannins, and chocolate malt. The finish is super long and elegant with more tar, blackberry, chocolate malt, and pepper. Quite a nice bottle. 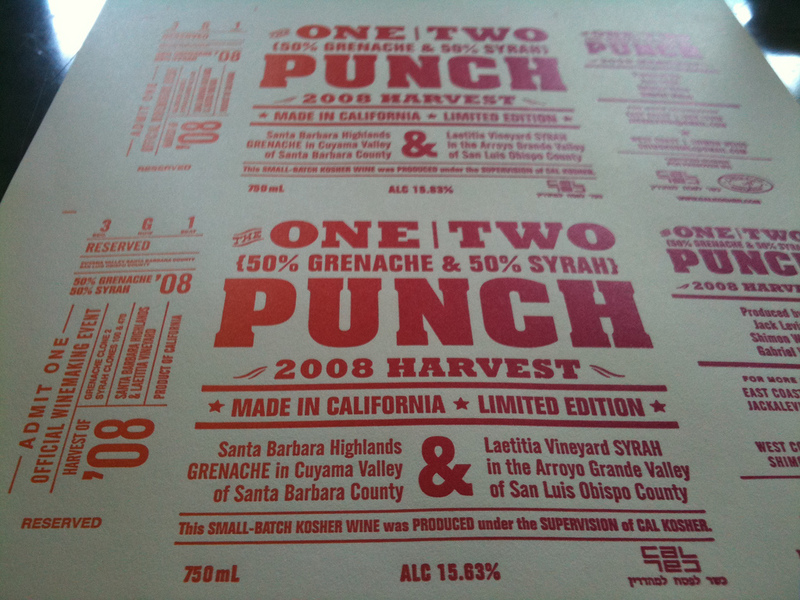 For those interested in buying some of the Syraph wine or the 1-2 (One Two) Punch wine please post a comment to get Shimon Weiss email address. I do not want to post it here, as it would just mean more spam for Shimon. I receive ZERO from their business. I am not affiliated or in business with them in anyway. I will reply to your comment via email with Shimon’s email address.